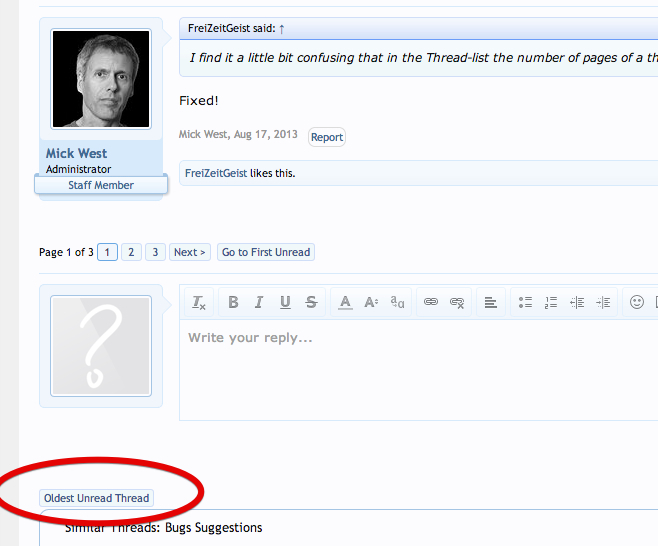 How to use "Next Unread Thread"
Discussion in 'How To' started by Mick West, Dec 7, 2013. And a button at the bottom of a thread view, under the quick reply, and above "Similar Threads"
Clicking on this will take you to the thread with the oldest unread post. If you don't visit all the threads, then it might show you far too much stuff. You might want to clean everything out, with "Mark Forums Read"
Basically it's like clicking on "New Posts", then going to the oldest thread listed there, then repeating. This just saves the constant going back to the list. I've changed it from "Oldest" to "Next". (Neither are purely correct, but "Next" indicates the usage better).